Thinking seriously of pulling the trigger on a Roxor and would love to hear from others on their experiences. For those that don’t know already, the Roxor is built by the Indian tractor company Mahindra. Beginning in the 40’s Mahindra made Jeep cj2a’s under license in India. They are now selling an extremely similar vehicle here in the US under the guise of OFF ROAD ONLY as a side by side. Think Polaris Ranger. Steel frame. Steel body. 5 speed transmission. 2.5L turbo diesel. High low transfer case. They are federally not street legal but several states have loopholes that allow them on certain roads. I think they are cool as can be. Anybody bought one yet? If they WERE allowed on all roads AND they had a higher top end speed above 45, I might,,,might consider one. The street legal in all states is never gonna happen. Safety. Emissions. Blah blah blah. The speed is electronically limited and a simple ecu flash removes the governor and increases hp and tq considerably. Top speed with flash has been shown to be about 75mph. I go by a Mahindra dealer near my farm and have seen these sitting on their lot. You would think they would be configured to be registered as an LSV, if you can't register them I wouldn't think they would have much of a market. I’d rather get an old cj for way less that I could drive anywhere. But I have seen these sitting on lots and they look good. They're a lot of money IMHO for what you get. Every off road manufacturer makes a UTV that could run circles around it. Weighs like 3,000lbs, my 900lb Polaris ACE 570's have 50hp these have like 60..
Plus any of the other ATV companies have tons of stuff you can add, and proven track record. You must not have looked for an old CJ (they're all old now) that you could drive anywhere. They'll cost more than the Roxor. 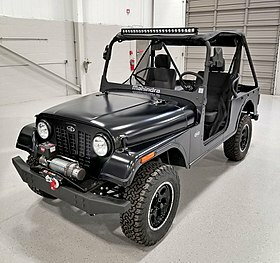 the roxor has a price range of $15-18K, that will buy you a damn nice Cj7. they are out there just have to look a little! Seems like he perfect candidate for a jeep "body swap," complete with the donor body's VIN plate. How do the dimensions compare to a YJ or similar? Wife's uncle has one for their property as well as some kubota rtv's and a Polaris ranger. Hands down I enjoy driving the roxor the most, in the Florida mud it's damn near unstoppable. If you're not a jeep guy you might not get it, if you're a jeep guy it's the only modern real jeep money can buy IMO. If I didn't already own a CJ2A I would be pressing the wife for one. Can't speak on reliability yet as it's still pretty new but it's a little beast. For me the debate is not modern SxS vs Roxor. The side by sides will run circles around any Jeep especially an old stock CJ or similar. I see the debate as being between an old and sketchy CJ or Samurai that IS road legal vs a new, reliable, and warrantied Roxor that’s not. Can the axles be put below the springs on the Roxor without any major suspension mods or parts replacement? Right now I'm leaning heavily toward either an old CJ, Sammi or 80s Toyota SWB reg cab pickup. Both with 4 cyl and 4 spds. But all of them are old at the point and price point and rust has taken it's toll 9x of 10. The Roxor vid mentions a coming "agriculture model" with PTO and etc on it. I'd sure like to see one with a SILENT 30-50hp gas motor with a sealed ignition system and snorkel intake for highwater crossing. Dealer network and parts availability are the only major obstacles I see for these Roxors right now. There pretty cool .I've watched a few tests on them and they are really hurting for a locker in the axles . Yeah I've seen several test vids and the open diffs combined with those silly BFG "Dust & Dews" make the things questionable on anything past wet grass. 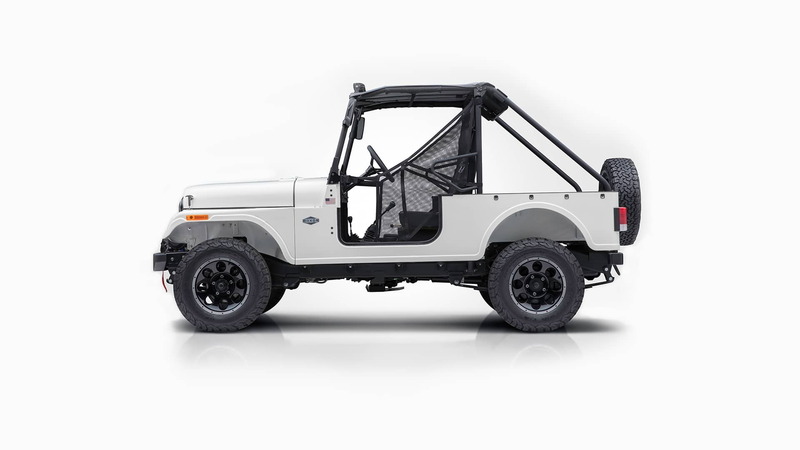 But two different locker options are listed on the factory options page.https://www.roxoroffroad.com/accessories A couple, few more inches of ground clearance, some Bogger tires and locking axles and that thing would be a beast for sure! But by the time all that is done your looking at what nearly $20k? 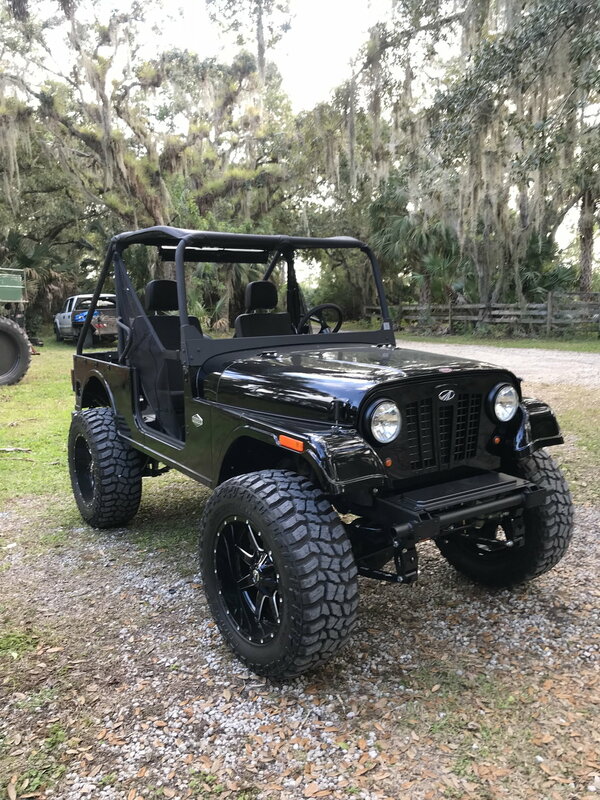 Damn, for well under $10k I can "bit & piece" an old beater CJ or Sammi that will go about anywhere. has a tuner on it to eliminate the 45 mph speed limiter. She runs pretty good!! I leave it at the ranch most of the time but I did go thru “dirt legal” and got it registered so it’s street legal. Has turn signals but still waiting on a windshield. These are pretty interesting. I'd like to know exactly how people get them street legalized. For the $$ I'd go out west and pick up a rust free LJ Wrangler (long wheelbase TJ Wrangler called the LJ). Captk that looks pretty sharp. What size tires are those and how did you make them fit??? View Next Unread Christmas Came Early for Me!